Actively and thoughtfully seeking and incorporating methods and tools in the 21st century landscape of education. Increasing faculty and interdepartmental communication. Initiating and supporting campus professional development activities to ensure students are learning, in alignment with RTC’s strategic plan. CITL is an integral part of ongoing and extensive professional development for faculty, supporting RTC’s vision of being a premier technical college in Washington State. The center is coordinated by Dr. Liz Falconer, Director of Innovative Teaching and Learning, who works with instruction department administrators and faculty, assisting in facilitating learning and teaching innovation across the college curricula. Her work includes the development, implementation and evaluation of instructional improvement projects; overseeing RTC’S statewide PD offerings, administration of faculty and staff professional development activities, and administration of the college LMS system. Zefire Skoczen, Massage Program faculty and Instructional Designer for Allied Health Programs, began working in coordination with CITL in January 2018 to assist faculty in the areas of course design, engagement, and assessment in Canvas. Dr. Falconer is a Quality Matters master reviewer amd an active member of the Washington State eLearning Council. Did you know? Faculty who participate in professional development have higher student retention rates! RTC's Center for Innovative Teaching and Learning is located in C105, and is a space for faculty and related instructional staff workshops, meetings, and computer use. It is coordinated by Liz Falconer, Director of Innovative Teaching and Learning. Full time faculty at Renton Technical College are expected to fulfill the state-mandated professional development areas of discipline, governance, and pedagogy. For both full time and adjunct faculty, there is also the institutional expectation and support for ongoing professional development related specifically to instruction. In 2015-16, RTC provided stipends for faculty to select from their topics of choice for a year-long asynchronous in-service. In 2016-17, there is support for participation in the Intentional Teaching Pathway, building a culture of shared teaching expertise and lifelong learning. 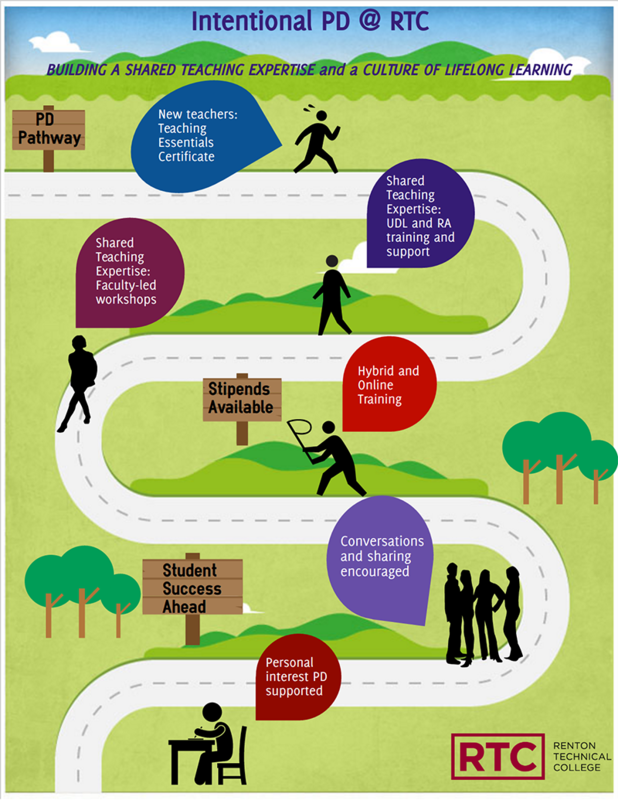 I am very excited about the Intentional Teaching Pathway that has been developed on our campus. Prior to coming to RTC, I had heard about the great work being done here with applying Reading Apprenticeship and Universal Design for Learning for student success. I look forward to the expansion of these concepts and practices across our curriculum in creating active, learning-centered classroom communities. Information on writing outcomes, types of assessment, and using rubrics and data to improve student success. Stroll the street for ideas! Your suggestions are welcome anytime!